Tells you every time your competitors get a new link to their website. The keyword suggestion tool analyses all visitors to your website over a time period of three months and identifies the keyword search phrases that deliver customers/prospects and assigns each a KAT-ratio, the higher the KAT-ratio the more important the keyword search phrase is in delivering customers, so these are the keyword search terms that if you improve their page ranking in the search engines will deliver more customers to your web site. This is very important because search engine optimisation is time consuming and expensive so you only want to target keyword search phrases that you know deliver customers. 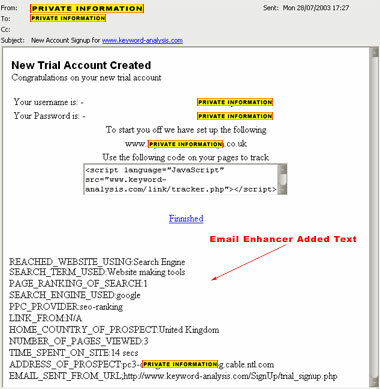 With Keyword-Analysis every visitor to the website from a search engine will be analysed. The page that your website was ranked on the search engine will be recorded revealing how important being on page one of a search engine listing is to you. More importantly this report will identify keyword search terms that deliver visitors but are ranked on page 2, 3 or lower. This information tells you which search phrases to concentrate your search engine optimisation on. It is amazing how many different keyword search phrases people use, one site regularly has over 3,000 unique page one ranked keyword searched phrases every month.Sample report of search engine page ranking, click on a keyword search term to view search engines delivering visitors and the page ranking of each search term. Do you think your competitors are clicking on the expensive PPC search terms just to run up your bills; this report was created because a site was loosing over $1,000 a month by competitors clicking on their PPC adds. This report monitors the IP address of all visitors and will identify multiply visitors from the same or a range of IP addresses. AdminFavorites is a popluar site for IT Professional looking for high-quality tools and utilities to administer Windows, UNIX, LINUX and Novell based networks. Here, you can find the resources to help you plan, deploy, maintain, and support successful network solutions. Windows management is becoming more important everyday. With the increase in the number of mission-critical applications residing on Windows servers and the ever-growing threats targeted at those computers, secure, efficient Windows management is more important than ever. On WindowsManagement.com, you can find the resources to help you plan, deploy, maintain, and support successful Windows based networks.